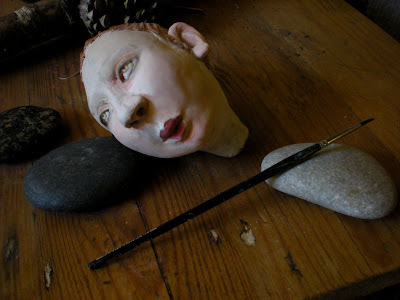 Started working on Sock Puppet's head this afternoon with a fine brush and a careful hand. This piece will get a full coat of porcelain slip, underglaze, rutile, some sanding, etc. Then into the kiln for a cone 04 firing. When it comes out it will then get more underglaze, crawl glaze and selected areas of clear glaze. It seems very quiet today. It's always quiet here, but it feels like a hush. As if the day said hush and is quietly waiting. Waiting for what only time will tell.